Even though we acquired the hangar before I started my term in office, I want to thank Mark G. one more time, for stepping forward and allowing us the opportunity to purchase the building. In the past three years the members have installed the ceiling, insulated the door and one wall, put up lights, fans and hung the heater. During that time we’ve used your chapter money to pay down the mortgage from 37k to 10k. What a great place to meet and it truly is a fantastic chapter asset. How can I forget the night at Oshkosh when Pete Gavin and the chapter FINALLY won first place for the chapter newsletter. I even remember the twinkle in Harrison Fords eye that evening when it was announced we won. Well, maybe it was the flash from a camera reflecting in his eye, but I think he was happy for us and that’s my story. And now Jeff Coffey has our web site in third place after one year. 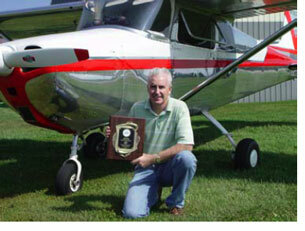 Chapter 25 now has a scholarship at Lakeville High School that helps an aviation student achieve a college education. They say talk is cheap, so we put our money where our mouth is! The past few annual award banquets have turned into a special evening enjoyed by our members and their spouses. The Christmas party at Dan Carroll’s hangar is another wonderful get together for our chapter. It’s fun to watch these events grow in popularity each year. The chapter checkbook looks outstanding, because you continue to renew your membership and support the annual raffle. Every month we got a new member or two, because you brought people with you to the meetings who were interested in aviation and they ended up joining because they liked your chapter. I asked for your monetary participation in a memorial fund for Earl Adams and you responded so quickly we had it done in about one month. By now you may have noticed a common thread in all the good things the chapter has accomplished the past three years. That common thread is “YOU”. You helped work on the hangar and gave Pete articles for the newsletter. You showed up for the banquets, parties and gave money. You brought new members to the meetings. I didn’t do anything, except ask for your help. You did all the work and for that, I’ll be forever grateful. Even the people at Oshkosh headquarters know what a great job you have been doing. I’m very excited about the chapters future and Jon Cumpton’s Presidency. He gets to kick it off with a bang as 2006 is the 50th anniversary of the chapter. One of the most incredible things is our very first President is still a member! Can you believe that? Congratulations Bert! The chapter will be looking to add a second aviation scholarship as Lakeville South has their first graduating class in May 2007. With the Airlake FBO starting a Light Sport Pilot program, the chapter will have a chance to add new members as they start flying the light sport aircraft.